Macao is a mysterious port city located on the southern coast of China and has become a tourist mecca, especially for its gaming industry. Celebrate Valentine’s Day this year with a romantic getaway at the luxury Sheraton Macao Hotel. Offering a “Stay for Three Nights, Pay for Two” promotion, stay at the Sheraton Macao Hotel anytime during 2015 with rates starting at just $119 per night. For Valentine’s Day, the luxury hotel’s Shine Spa is offering two indulgent Valentine’s Spa Journeys – the Candle Massage or Lava Bamboo between February 6 and February 15. 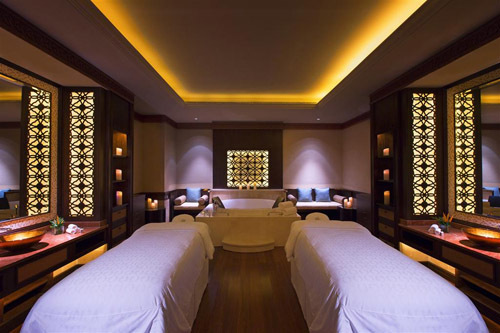 Each spa journey includes an amazing 90-minute body massage with a choice of warm bamboo sticks or drizzling candle wax. Once your spa treatment is over, couples can enjoy a leisurely Shine Spa Bath experience with strawberries and a bottle of bubbly. The price begins at USD $362 per couple. After your spa pampering, it’s time to plan for a romantic dining experience. Bene is a modern Italian trattoria-style restaurant located at Sheraton Macao Hotel. Restaurant Executive Sous Chef Gaetano Palumbo has created a special “Amore” menu that includes tantalizing dishes including – oyster lemon granite with passion fruit vodka, baked rib lamb with artichokes and potatoes and John Dory with saffron potatoes. The delicious six-course “Amore” dinner also comes a decadent “Dessert of Love” to be shared between the couple. This incredible fine dining experience is priced at just USD $237 per couple. If you want to step up the romance, consider dining under the stars in your own private poolside cabana. You choose between five, four and three course set menus. What an experience! Pricing starts at just USD $362 per couple. If you are interested in booking the Valentine’s Day package and stay at the Sheraton Macao Hotel, please contact us today. We can assist planning and booking your entire itinerary. Return here and follow this luxury blog and read about the latest luxury travel industry news and special package deals.